I only speak English, as I'd mentioned yesterday. However, I do know a bit if French. I first learned it back in highschool (about 95 years ago, it seems), taking 2 year's worth. I originally picked French because, at the time, I was sure I was going to be a hockey player and if I had French-Canadian teammates, I'd like to know what they were saying. 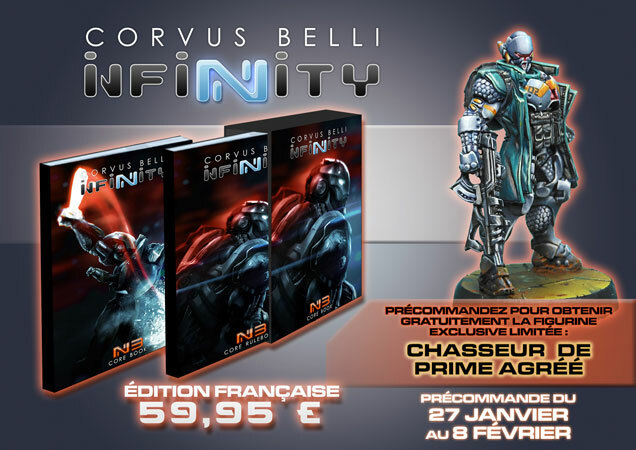 Well, I never became a hockey player and I never kept up with my French, but for those of you out there that do speak French, you can now pre-order the 3rd Edition Infinity rulebook from Corvus Belli and get a free model, too. Actually, you can order the book and get the free model even if you don't speak French. Pre-orders are being taken now and will last until February 9th. Orders made during that time will come with a free, exclusive Authorized Bounty Hunter mini. This figure won't be available for retail sale later, so if you want it, you'd better get to it.